Utrecht is a rapidly growing city that is convinced the bicycle can and should play a major role in keeping the city liveable, accessible and economically strong. Reason to give the bicycle precedence in the mobility policies of the municipality. The city wants to make cycling even more attractive for the over 100,000 people who already ride to their work, school, university, public transport hubs, shops or their homes every day, but also for those who have not yet discovered the joy of cycling. 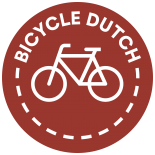 Even though the transition to a genuine cycling city is still ongoing, Utrecht thinks it has already done so much work, in the past four years especially, that it deserves the title Cycling City of the Netherlands in 2016. I also think it does. People queuing up for a traffic light in Utrecht. This intersection is up for a complete makeover later this year. Residents want to go a lot further than the city by banning cars from the central main road here. This is the street with the oldest cycleway of the Netherlands from 1885. The Utrecht slogan for its Cycling Policies. I have already shown you many Utrecht examples on my blog. Utrecht is my place of birth and although I haven’t actually lived in the city since 1995, it still feels like my hometown. I am aware that I am not really impartial judging the city for the title in this competition. But to level the playing field I visited Utrecht, just like I did the other four finalist cities, to film everything on just one day. As with every other post I wrote, I try to keep this post as factual as possible. 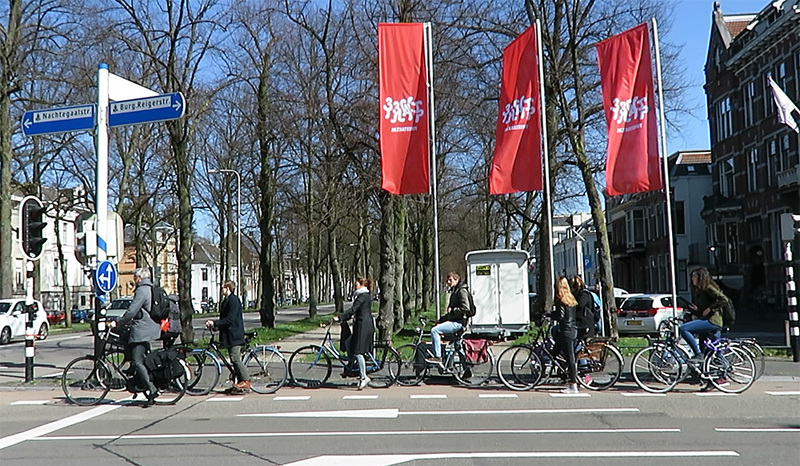 The busiest cycleway in Utrecht (and the country) is used by 25,000 people on an average working day. Utrecht is the largest of the five finalists, not surprising, since it is the fourth largest city of the Netherlands. The city proper is home to almost 340,000 people, but nearly half a million live in what is considered the agglomeration (a single built-up area). The even larger city region of Utrecht comprises municipalities with a total of well over 700,000 inhabitants. Like Nijmegen and Maastricht, Utrecht was also founded by the Romans. Traces of the Roman settlement can be found in the historic fortified city that still has many historic buildings. The central location makes Utrecht an import transport hub. The Nazi threat to bomb Utrecht as they did Rotterdam was one of the reasons for the Dutch to surrender in May 1940. It means Utrecht was spared that fate and it suffered relatively little in World War II. Plans for major roads through the narrow streets of the historic city centre were started in the 1950s and 1960s, but never really finished and often reversed. The partially built 1970s ring road in the place of the city moat has been removed again fourty years later and the water came back just last year. A new roundabout in Utrecht. Right of way for cycling on a bi-directional cycleway around the roundabout. In recent years cycling has increased by 4% every year, even by 6% on routes to the university and the new urban expansion “Leidsche Rijn” (home to 81,000 people in 2015). This means some cycleways are really reaching their limits. During rush hour space is at a premium at some locations. To create more space for cycling, mopeds and scooters (unfortunately only the fast type) have been sent to the roadway, just last March. To create even more room for people, the council has decided it wants to change all 2×2-lane streets in the city to 2×1-lane streets and use the space that becomes available to improve the environment for extra green and walking and cycling. This bold move sets Utrecht apart from the other finalists, but it is not completely surprising with an alderman for traffic who once literally said in one of my videos: “Nothing is too much for cycling!”. 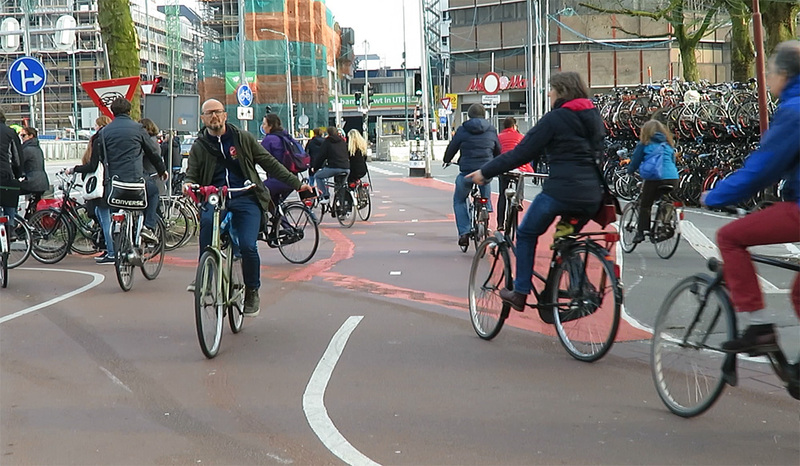 With these policies the Utrecht council goes against the will of some provincial council members and Rijkswaterstaat (the national road authority). On the day I published this post members of the Lower House even asked the minister of traffic what possibilities she sees to make Utrecht change its plans. A bit late, examples of all stages of this development can be seen throughout the city already. Some streets have been converted (much to the delight of the residents), other streets are currently under construction (or that is just about to start) and yet others are in the planning phase. As with Groningen and Maastricht, I don’t want to include future plans in my judgement for this year’s title, but this clearly demonstrates that Utrecht does indeed consider cycling and walking the most important means of transport. Another quick solution to the lack of space was the creation of an alternative to the busy cycle route to the university: a marked route through quiet back streets in the city centre. The inconvenient cobble stone surface of this so-called “Herenroute” is the price to pay for having more space. J.M. de Muinck Keizerlaan in 2016. The street has been downgraded to only one travel lane in each direction. Improvements to the cycling network, that have been finished already, are very impressive. Red asphalt is popping up all over the city. Even in streets where residents were against it. Notably in Leidseweg residents complained that the red asphalt (as opposed to the reddish-brown brick surface the street had so far) would not be appropriate in their “historic street”. The same residents did want to keep parking their cars in front of their homes. Apparently those parked cars are not an eyesore in a historic environment. The city council rightly decided against the will of these residents and in favour of improving cycling conditions on this main cycle route. The end result is a perfect surface that goes very well with the historic look of the street. Leidseweg after the reconstruction as a cycle street. The red asphalt was used against the will of the residents who claimed it wouldn’t look right in their historic street. This decision can be seen as an exception to the rule that Utrecht takes public consultation very seriously (or perhaps as proof, depending how you look at it). Another example is the city’s call on people to report traffic lights they thought were not necessary. This resulted in thousands of entries on a website. After careful consideration the signals at many intersections have now been switched off. Some only outside peak hours, some all the time. This measure was also taken to reduce the number of times people cycling have to stop. A further example of public participation is the so-called City Discussion on Cycling that took place in January 2015. About 180 Utrecht residents (and some others like yours truly) discussed ideas about the state of cycling as well as its future in Utrecht. Many ideas ended in the aforementioned policy “Utrecht – we all cycle”. One such example has to do with the many detours which are necessary due to the reconstruction of the Utrecht Station area. This reconstruction has been ongoing for almost 10 years and it will continue until about 2020. It has led to a lot of complaints about the cycling situation in that area. The city did already have regulations for width and surface of detours, but in the City Discussion people also asked the city to regulate the number of times a detour route may be changed. Mainly because the often changing detours led to confusing and dangerous traffic situations. Temporary cycling infrastructure on Smakkelaarsveld in the heart of the reconstruction area around the central railway station. As bold as the city may be in plans to redesign the streets, stakeholders sometimes think the city still isn’t audacious enough. One example was the reconstruction of Mariaplaats where the initial plan kept a much higher number of car parking spaces than the residents and shop owners in the street thought was acceptable. At their request the city changed the plans and it reduced the number of parking spaces. A similar situation has recently arisen when the city announced its plans for the intersection Maliebaan/Nachtegaalstraat/Burg. Reigerstraat. The city plans a large ‘stretched’ roundabout, but residents want to remove most of the space for cars. Clearly, many Utrecht residents support the council’s idea that the city needs to change, but even more radical than the council dares to. Creating enough spaces to park your bicycle is a real challenge. Utrecht tried to improve the situation with smart solutions. The dynamic bicycle parking guidance system was a high-tech measure. Marking space on the street for dual use is a very simple one. In a trial, space on a square is supposed to be used by delivery vans in the morning, but bicycles on kick-stands can use the exact same space during the rest of the day as parking space. 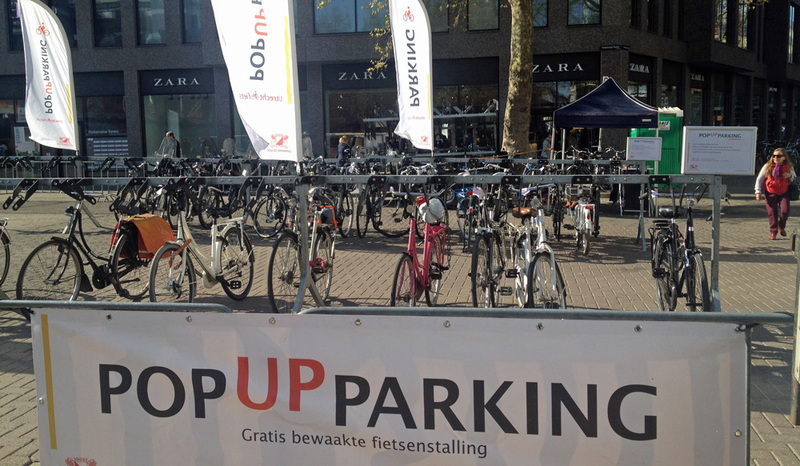 Utrecht also deploys temporary pop-up parking facilities at very busy locations; free and guarded. That Utrecht is building the world’s largest bicycle parking facility for 12,500 bicycles at its central station may be known around the world by now. It will bring the number of parking spaces around the station to 33,000 by 2020. Pop-up bicycle parking on Vredenburg in the main shopping area in Utrecht. The facility is only there on Thursday nights and Saturdays, the time shops draw most customers. 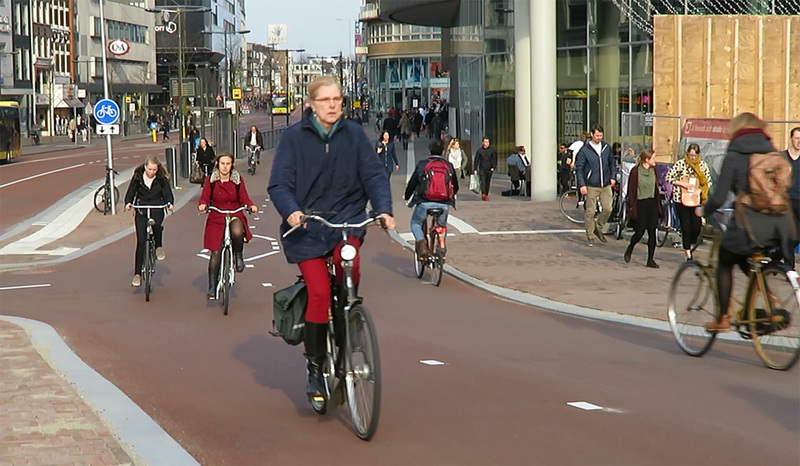 Utrecht has expressed an ambition to become one of the best cycling cities of the world and that is already clearly showing in the policies and on the streets. Remaining challenges are taken up with vigour. Compared to the other four candidates Utrecht is really doing exceptionally well in my opinion. Utrecht has one final advantage over some other finalists. Because it hadn’t applied before, Utrecht did not reuse an earlier bid as some other contestants did. That made Utrecht’s bid the only one that really incorporated this year’s ‘Bikenomics’ theme well. The ultimate decision is up to the jury and it is a tough call this time, as there is no city which is really much better than the rest. Maastricht and Groningen are clearly good, but not good enough. I think outsider Goes, Nijmegen, but especially Utrecht would be eligible to win. I am really looking forward to hear the jury’s verdict on May 19th! 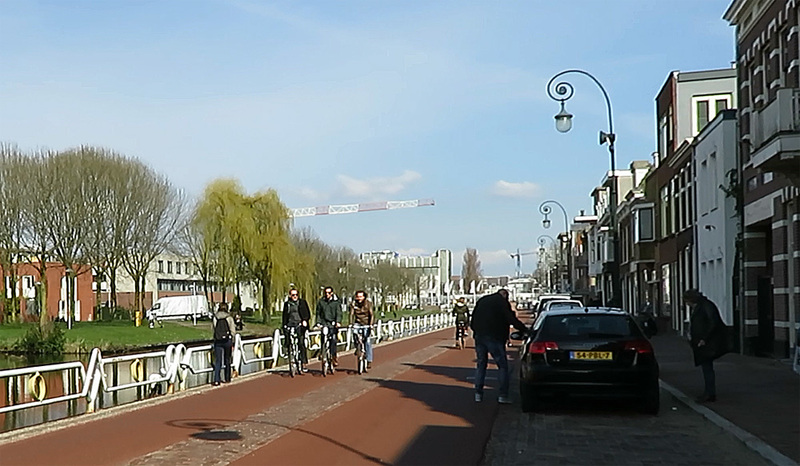 My video portrait of Utrecht, maybe the best finalist to become Cycling City of 2016. 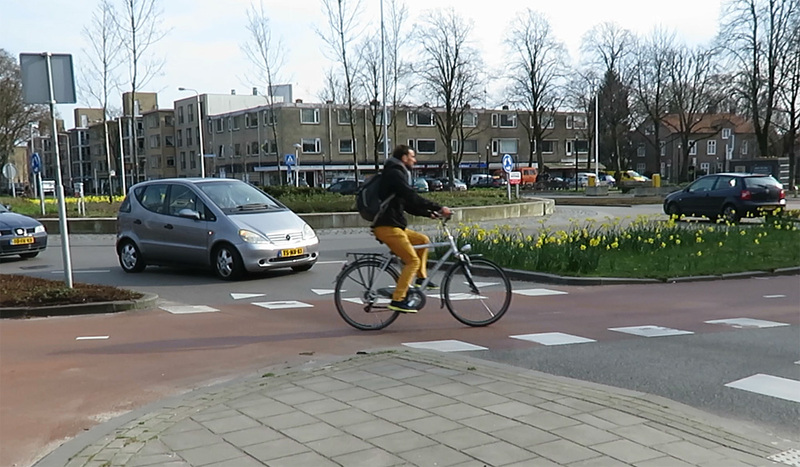 So the Utrecht city council is reducing the number of vehicle lanes to discourage driving? That’s pretty bold. Is there enough of a driving constituency that these “road diets” receive negative coverage on the local tv or in newspaper? The coalition here in Utrecht is quite broad, from right-liberal (very pro-car, pro-business, pro-parking) via mid-left-liberal/green-friendly to left/green. 1) The master-plan called “Utrecht Aantrekkelijk en Bereikbaar” (UAB, http://www.utrecht.nl/fileadmin/fileshare/images/DSO/verkeer/AantrekkelijkBereikbaar/Ambitiedocument_2012_01.pdf) is the base for this coalition. This short document states that there should be a balance between liveability and accessibility. The latter was always heavily influenced by commuters not living in Utrecht. 4) The actual plans includes also the redesign of a crossing to roundabout with a much higher capacity. See https://www.youtube.com/watch?v=VAHEfYx8rMY for a simulation. 5) Yes, because Utrecht is in the very center of the Netherlands, the national government and the province (regional) are very concerned that the city cannot absorb the heavy highway traffic. But the large number of highways around of Utrecht was the very reason for writing UAB. A very thorough explanation, thank you. Los Angeles isn’t necessarily downgrading arterial streets but it is implementing a number of “road diets” (aka reducing the number of lanes) but this is driven by safety, not a desire to reduce car use. I love seeing all the work Mark highlights but to some of us the most relevant parts are difficult to communicate visually, like the politics and traffic studies that make these changes possible. So I love hearing about the fights over the color of the pavement, if any any projects are met with opposition, etc. 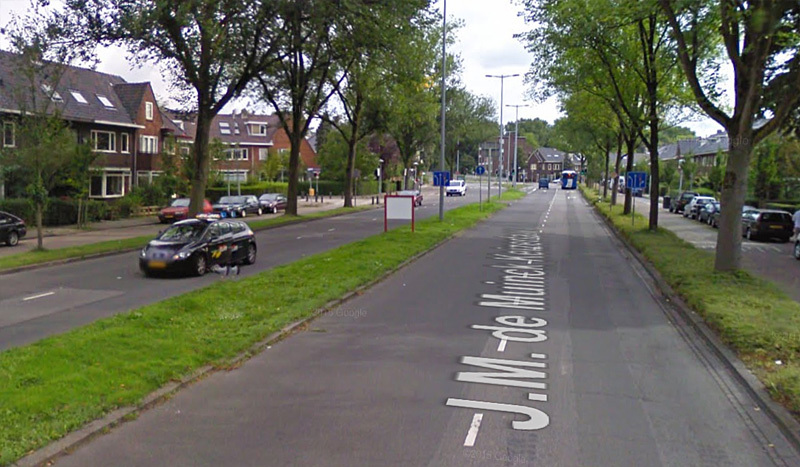 I would also be interesting in knowing what Dutch thresholds are for reducing the number of lanes. In US transportation planning a couple of general rules are that a single lane of traffic can carry 10,000 vehicles a day and if peak hour volumes are below 1,000 vehicles per hour and a street has more than one lane in each direction, then the number of lanes can likely be reduced to one. The classic “road diet” configuration which features 1 lane in each direction with a center turn lane is said to be achievable with few traffic impacts if the average daily traffic (ADT) volumes are below 20,000 (that includes traffic in both directions). I am willing to bet Dutch engineers/planners/politicians have a higher tolerance for traffic and are more likely to consider road diets in more “extreme” situations than compared to US. Mooi, op nederlands op goed fietsen. I think I might have accidentally picked up the Fryslan for good via that shibboleth with butter and cheese. Either way, that sentence was the first I made in Dutch using just my memory. I think Mark that you’ve lost your best feature (other than being honest and living car free): your accent. It used to be stronger about 5 years ago. Too bad you mostly lost it. I am planning to come over to the Netherlands (specifically Drenthe. Most people have no idea about the nature and good recreational cycling in Drenthe unless they are Dutch or maybe German, and thankfully for me, an Englishman with excellent English offers tours). I know that the people can mostly speak some Dutch (I have phoned a few Dutch friends in the past. I tried to talk with them using a phrasebook. After they noticed by bad pronunciation, sometimes bad grammar and my accent, they switched to English), but the signs are mostly in Dutch (except in Amsterdam where all of the coffeeshops are labeled coffeeshops not koifee winkel, don’t need to go there though, not 18+). How feasibly could I understand what to do and where to go without much knowledge of Dutch when reading maps and signs? I only have some seconds before I pass by at 25 km/h on a rental omafiets (which I know is singular). Another thing that you might want to take care of, is noticing the bicycle signs of the ‘paddenstoel’ (literally ‘toadstool’) type, see https://nl.wikipedia.org/wiki/Paddenstoel_%28wegwijzer%29 – they are rather close to the ground, so you easily overlook them if you’re not aware of them. They are common in touristic areas such as Drenthe. I just wish you wouldn’t call it a “downgrade” when a motor travel lane is converted into cycle, walking or planted space. It’s not a downgrade, it’s an upgrade! Not all new infra is better by the way, there are some horrible bits with curves of over 100 degrees, like when going towards to city from Graadt van Roggeweg. An important main route. I live near the Van Egmondkade (recently upgraded, at 0:41) and I have to say the amount of new infrastructure my adopted hometown is laying is impressive. Cycling has really become much more pleasant in the past few years. Having seen all the entries I think either Utrecht or Goes wil win, though I’m hoping it’s Utrecht. At times the city resembles a building pit but most projects are quickly over, it’s just a pity the central station area has been such a mess for such a long time. The traffic lights on for example A’damsestraatweg that are turned off most of time are an inspired change for the better with minimal costs, well worth adopting in more spots throughout the country. Thank you for your comment. Always good to hear the perspective of a local. I also think Goes stands a good chance, but it is so much smaller than the rest and their weak point was this year’s theme ‘bikeonomics’. That proved a difficult theme for all cities. 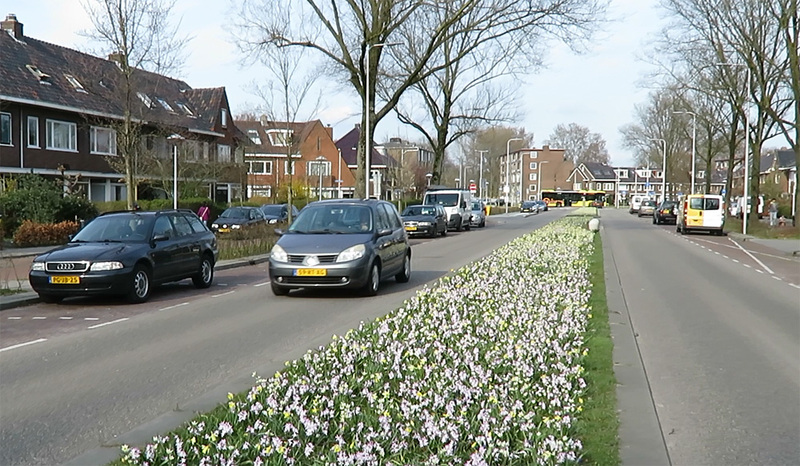 I cannot help but laugh in frustration when you tell about the change in colour on Leidseweg. Our city had an almost identical complaint about new bicycle infrastructure, sadly in our case, green sharrows, although at least positioned correctly, through an older neighbourhood. Residents complained about it citing “green doesn’t fit with heritage”….which of course, all the parked vehicles of course fit just fine in a 1900s neighbourhood. Sadly, the result was our city caving to the demands of the residents and buying and installing different colour sharrows for the one street. The “color” discussion was the final stage of an ongoing discussion during fifteen years or so, when the municipality “improved” the Leidseweg with bricks because the local residents insisted this was the correct historical pavement. The Leidseweg was and is the main connection between the city center and Leidsche Rijn, a city in itself and just being developed then. The result was disastrous. One of the main arteries for cycling had reached the top of worst roads overnight because local resident “had decided” so. It led to dangerous behaviour of cyclists because the water side of the road had much better pavement. A pavement discussion would never have been taken seriously for any arterial road for cars. The municipality and all its “transportation” aldermen since then were confronted with this enormity over and over by the local Fietsersbond and others until it became unbearable. Therefore there was no other option than tarmac now. Now the cyclists “allowed” the local residents to discuss the color only. The cyclists wouldn’t care as long as it is tarmac. In short: a “historical” decision finally repaired. Thank you, Theo, that is interesting background information. Very good that this has now finally been settled! BTW, that junction redesign you covered yourself Mark on the Amsterdamstraatweg and the city ring road, how is that going to be affected by the downgrade to 2*1? Are your commentators finally going to get their right turn lane 😉 ? You already answer your own question in a way. At the intersections the extra lanes will remain, but then as dedicated turning lanes. Hallo Mark. Nog steeds bezig om Nederlands te leren. Now the comments about downgrading 2*2 roads to 2*1 roads is quite interesting to me. My city is covered with 4 lane arterial roads, 2 in each direction, although usually limited to 60 km/h (with a design speed of 70, so you can guess what the 85th percentile speed is. 90% of pedestrians hit at 60 die). That is much too fast in most of the urban area of course. I have been trying to convince people to accept road diets like the one you mentioned for some time, but people just don’t seem to understand how for the most part, 2 lanes in each direction plus turn lanes, these huge roads aren’t really needed. Now if the extra carriageway was turned into a pair of bus lanes provided that other needs like cycling is taken care of first, then that is something I support, no induced demand for motor traffic that way, and electric buses are more efficient than cars. Last year, my city council, in one of it’s stupidest decisions ever even when the writing was on the wall and they should have known better, even going against their own policy of complete streets, turned a 6-9k VPD (never more than about 1000 vph) roadway with buffered bike lanes (1 metre buffer, 2 metre bike lane in each direction) into a 4 lane divided roadway! Only 2 out of 13 councillors voted against. What a group of 11 hypocrites. So I was wondering, what is the maximum capacity of a well built 3.1 metre/lane 50 km/h distributor road with mostly roundabouts and some traffic lights? I also find it fascinating that Utrecht is turning off so many lights in the midday and night. In Edmonton, the city opposes this based on “lack of protection to pedestrians” and may increase drag racing”. As if you couldn’t address these with the protected intersection design, some median refuges, maybe some zebra stripes and a speed table designed for 50 km/h. What is the opinion of the general public on this issue in the Netherlands, Utrecht specifically? I am not able to give you exact numbers for maximum capacity of a lane. The general opinion about turning off traffic lights is very positive. People really like that. That is also clear from the massive response the city got. Some parents were worried about crossing the roads by their children, that is why some signals remain functioning in rush hour. But off peak there is almost always a gap in traffic to cross the streets, especially with central refuge islands and the maximum of 3 lanes to be crossed at the same time. Generally 3 lanes is a nightmare here. One road many people have to negotiate to work is 3 lanes each way with a large median strip. The posted limit is 60 km/h and the road carries 50,000 vehicles/day. The accepted maximum carrying car capacity for a road with roundabouts is 6,500 and a single lane each way of up to 10,000-15,000. This is of course with few intersections and 3.7m lanes. Ahh Australia. The land of V8’s and Bogans. I think Mark included turning lanes. The road otherwise has the volume suitable for a single lane road on the links, but because of the flow on links, exchange on junctions on the main city arterials of distributor roads, this usually involves roundabouts or traffic lights, and the latter, to preform most efficiently, and the safest (so that control over the different directions via separate signals is possible), needs 3 lanes. He was not referring to roads that are ordinarily 3 lane roads. I wouldn’t be surprised if there are no 3 lane distributors per direction on links, almost certainly not 4 lanes per direction like my city wants to build a few kilos to the south of my house. This entry was posted on 19 April 2016 by Bicycle Dutch in Original posts and tagged Cyclists' Union (Fietsersbond), Fietsstad, Utrecht.